From the site that brought you eight different news feeds in six months, comes a wonderful new toy. A profile dedicated not to what you are, but everything you have ever been. Timelines, introduced last week through developer beta, have been getting a lot of press – but what might they actually mean for your profile? It’s fairly spartan for now – I’ve put in some extra information, but largely, the moment you activate your Timeline, the magic… Doesn’t exist. I’ll admit, for the first few minutes, I didn’t see what the big deal was. What do Timelines do that Profiles didn’t? One of the biggest features the new profile system enables is called Milestones – you can set one for just about anything. A birth, a marriage, a death – the new system allows you to go back through your life and mark out the things you want to communicate as important to you. First thing I did? 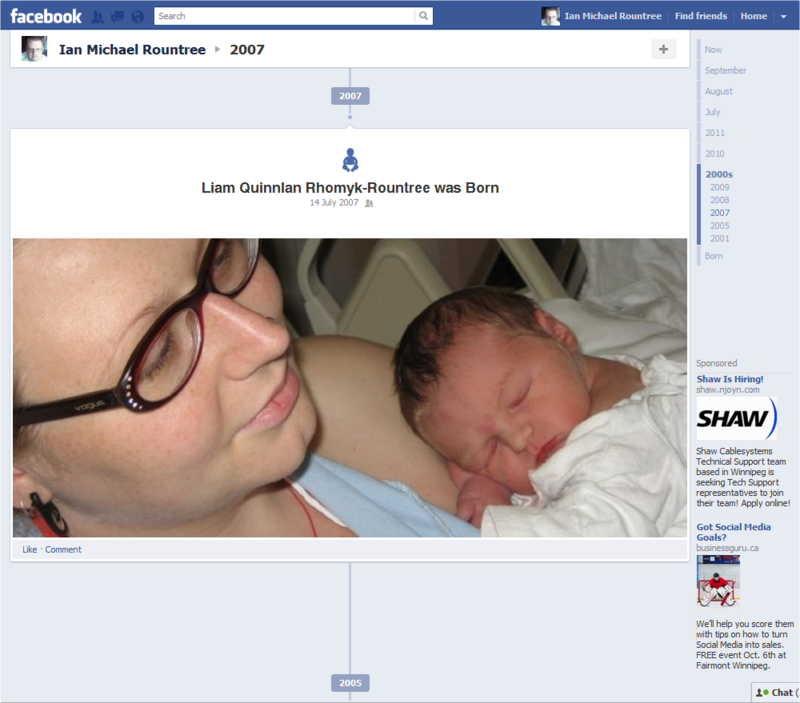 Marked the birth of my son, Liam. Pretty important event in my world. I’m sure I’ll get around to finding a picture for my own birth in 1982 eventually – but there’s no rush. Milestones aren’t time-sensitive the way status updates are. I can wait until I’ve got access to all the slide shows from the year my family spent in Australia before adding the marker in my profile that says I went there. Next time I travel, I can build a Milestone out of the trip as it happens – and use one of the photos from the trip’s album to do so. But that’s not all – with the Timelines system, Facebook’s changed how their entire update methodology works. It’s not listed specifically as a feature, and it’s certainly not obvious, but Facebook seems to be moving away from the pure “timely updates” theory of social networking, toward creating a full life record within their system. The box you’ll see on your Timeline (and it’s not clear whether this will look similar on your Home screen) does the common Status/Photo/Place combination as usual – but the kinds of milestones you can add seem to suggest a much broader scope to the site. Sure, we can mention we had a child or got married… But adding a pet? Losing a loved one? Achievements, awards, and health and wellness goals? This isn’t the usual profile-hygiene fare here – it’s a pretty big deal. When combined with the marked difference in how Facebook is now displaying news on your home feed – thanks to this month’s News Feed revamp – it’s clear the network is putting some thought into the kinds of news people want to read. The same people who religiously review the Obituaries in their local paper might, for example, might be the kind to mark only Milestones in their family’s Timelines as top news, and train the system only to promote big events. The people who are most interested in music culture may de-prioritize their friends’ news in favor of a particular set of band and artist pages. 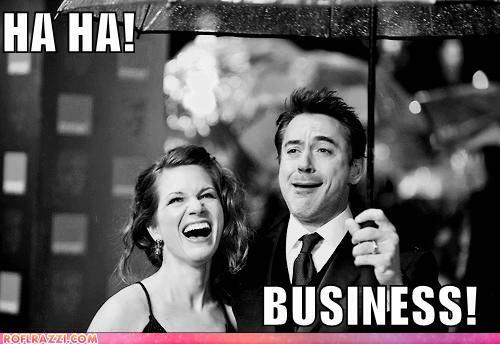 Relentless business people? We know what they’ll mark as important, don’t we? How Timelines might affect your personal brand. 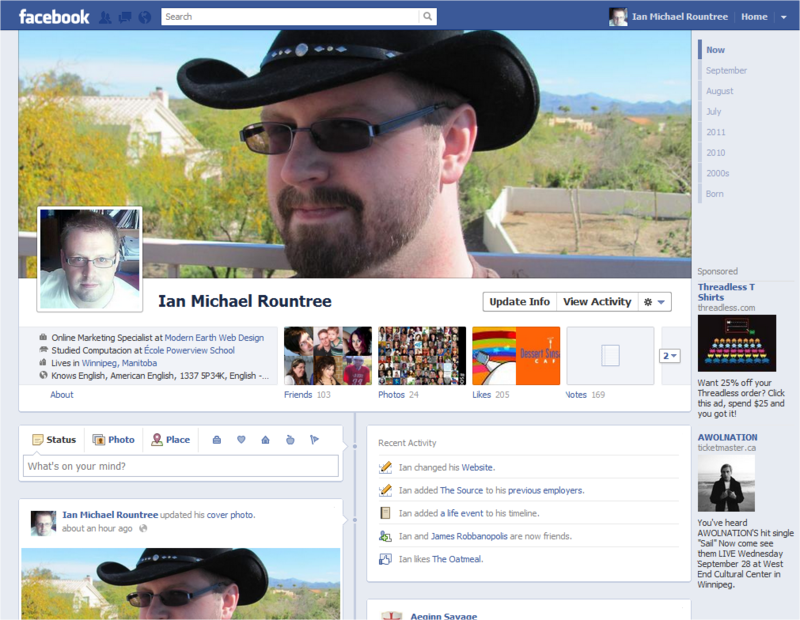 Facebook has never really been good for a personal brand directly from the profile side of the site. Pages, sure – we can optimize them to work with a marketing strategy… But now? Imagine tailoring your milestones and life events to only highlight your professional life. Conferences, speaking engagements, promotions, job changes – the list is endless. You can build your Timeline to reflect a single aspect of your life, and go for as much completionism as you can stomach. Again, it’s a case of choose your own level of involvement. I’m sure we’ll see a whack of personal branding guides over the coming weeks from some very opinionated voices. Has privacy on Facebook changed? Naturally, the changeover to Timelines – and associated App-level permission changes – is causing some concern over privacy. But, then, every change the social network makes to its system and capabilities seems to have that effect. This time, particularly, there’s some concern over apps gaining permission to automatically share what you’re doing. For example, if you authorize the New York Times as an app, you may find mentions of every page you view on that site in your timeline. This persistent auto-sharing may not be a big deal for some people, but imagine seeing 75 to 100 updates in your stream, from one avid news reader. Yeah. Not a privacy concern. But I imagine a lot of people will either get annoyed, or immediately shunt these kinds of updates off their feeds – thus destroying any value for the app-makers. Once again, it’s an opportunity for thoughtless publicity (not a bad thing) to turn into obsessive annoyance (a very bad thing). And only your friends list can determine which you’ll end up receiving. Because that’s not what they’re for. By their very nature, social networks are sharing platforms – you don’t share privacy. That’s not the point. Any assumption going against this grain is fundamentally flawed – so why worry about it? We’re still not very good at dividing our personal and professional lives, or our online and offline lives, or our family lives and public lives. So rather than being concerned that Facebook and other social networks are “stealing our privacy” we need to get better at self-censoring. If you don’t feel comfortable sharing something with the world – it may not be a good idea to put it online. While privacy and restricting options do exist, assuming they’re solid is not a good idea. In the end, it’s all a game of “Choose Your Poison” anyway. How you present yourself online is closer to your choice of haircut, than it is your choice of friends. There will be bad hair days on your social networks, and times when it’s so fantastic you worry about being narcissistic. Learn to live with that, and you’ll be fine. We used to think of Facebook as another photo sharing service. Then it was a microblog alongside. Then it became ten thousand other little parts of our lives. What do we call Facebook now, I wonder?